Fall Fashion Must-Haves for the Office! I am a firm believer in the saying “beauty is on the inside” but we shouldn’t settle for that by letting ourselves go and neglecting the beauty on the forefront. I think that when you look your best, you feel your best, and when you feel your best, you DO your best. As someone who works in the Public Relations, Marketing and Event Planning industry, I’ve learned that your image is one of the most important aspects of the job. While not every woman needs to dress up on a daily basis, they should make some kind of an effort to let others know that they take pride in themselves and what they are doing. Long days in an office can drag, and quite frankly when those days are spent dressed like a frump, they are far less enjoyable. A fun outfit and a pop of color will undoubtedly lift your mood and enhance your work day! Whether you could grace the pages of Vogue or find yourself hiding behind those pages, everyone has the opportunity to enhance their image! Fall is like a fashion jump start-the perfect time for a wardrobe pick me up. A statement bag: Red and cobalt blue are huge colors this season. 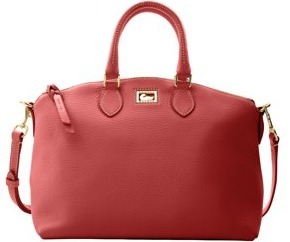 I am in love with this red Dooney and Bourke satchel, it is so classic and simple! Leather is usually quite heavy for the Summer months, but Fall welcomes the sweet smell of leather with open arms. I plan on purchasing my very own- VERY soon. Nail polish: Fall nail polish always brings back my favorite shades- the deep colors! Time to retire the pinks, pales and brights- make way for the dark neutrals; army green, dark blues, browns, deep purples, maroons and nudes. If you’re ballsy give the half moon mani a try! Faux Fur: Last season the fur trend exploded-and it looks like it is back for more. The faux fur vest is the perfect accessory for the office. The best part about it- it serves as a substitute for a heavy coat. Ankle Boots: These are by far one of my favorite shoe styles. Ankle boots can be worn with slacks, skirts or dresses (not all shoes are born so versatile)! They are typically more comfortable than a heel and come in a variety of fabrics, colors and styles. You can’t go wrong with black suede! 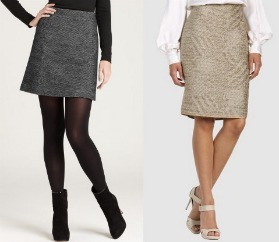 Skirts: My favorite thing to wear in the fall is a skirt with dark tights, a turtle neck and ankle boots. Tweed pencils have always been a Fall favorite, but don’t shy away from A-line pleats and prints. A single animal accent piece is still very much acceptable. There are so many skirts to choose from, find the style that best suits you! What are your fall must-haves? Share in the comments below!